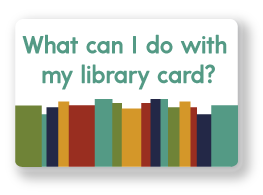 Carrying your library card opens up a world of opportunities! Check out and renew books, DVD, and audiobooks. Checkout, return, and renew books. is a cultural pass program that allows Illinois public library cardholders access discounts at museums, park districts, historical societies, zoos, arts centers, recreational facilities, and other attractions.